PINESPRINGS Is located ONLY 7 miles from downtown HELEN GA. Strategically located on our Blue Creek Resort! Pinesprings offers the very best for an entire Family Vacation or a Group Getaway. Our largest cabin with 5 bedrooms 3 bathrooms. Featuring cathedral ceilings and HUGE walk in showers. We spared no expense in LUXURY or ENTERTAINMENT. Gather in the living room for entertainment, in the kitchen for a family style meal or in the game room for a game of pool. 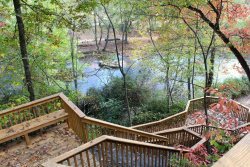 Being located on our Blue Creek Resort, it has easy access to our almost 2 miles of private hiking trails. Tucked away into nature, completely peaceful and with FREE wifi! Enjoy a 10 minute drive to Helen where you can feast on a delicious variety of DINING, visit the wineries & do some unique SHOPPING. Whether you are booking this for a family getaway or a group, this is a PERFECT cabin to meet all your needs and will make you HAPPY you stayed here, keeping you coming back year after year. Dist. from Helen: 15 min. Dist. from Office: 1 min. Dist. from Trout Pond & Blue Creek: 2 min. The road to this cabin is a nice gravel road. The maximum number of vehicles in the driveway is 4. No exception to the max number of people. Blue Creek cabins will monitor this cabin to avoid any groups over this amount. No large party groups over 12. A max of any larger groups than this will forfeit your reservation. Seasonal Fishing Package at Blue Creek Cabin's PRIVATE TROUT STOCKED POND available. Charcoal BBQ Grill. Charcoal NOT included.